On 18 April district court of Ašmiany concluded a trial of Belarus Press Photo – 2011 album. The KGB, which initiated the case, argued that the album contains extremist elements and the court agreed with it. Belarus enacted the Law on Counteraction against Extremism 2007. Security services elaborated it in order to prevent potential colour revolution in Belarus, but subsequently they rarely applied it. On a few occasions over the last five years they deployed this law. But the judiciary did not always take the side of the KGB. In some cases it declined KGB demands to declare extremism. The Belarusian KGB prepared The Law on Counteraction against Extremism in 2006. It aimed to prevent mass protests and another colour revolution in the post-Soviet space. Civil society perceived the law as political instrument which gave additional grounds for political repression. Apart from usual concepts of terror, violent seizure of power, paramilitary formations, fomenting racial, religious and other kinds of antagonisms, it counteracts “mass unrest on the grounds of political and ideological antagonism”. What is more important, it qualifies the act of “humiliation of national honour and dignity” as extremist activity. The law also provides a definition of “extremist materials” – informational product which promotes extremist action. So, the judiciary can qualify practically every political action directed against the regime as extremist. Equally, it can qualify media and information products as extremist if they involve political elements. Practical sense of the law in legal terms looks unclear, since all main extremist concepts already exist in criminal code of Belarus. However, the application of the law did not appear as cruel as many expected. Improvement of relations with the West in 2007-2010 prevented it from being fully deployed. Yet the KGB tried to use the law occasionally to deal with certain undesirable publications such as books, CDs, bulletins and newspapers. 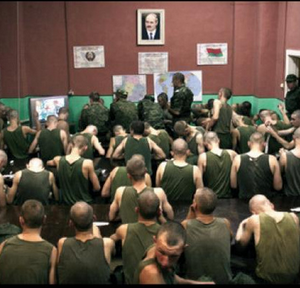 The recent case of Belarus Press Photo – 2011 gives a good illustration of such selective application. Belarus Press Photo is an annual contest of photos taken for mass media. The album of 2011 (available online here) contest contains numerous photos of protest after elections in 2010 as well as “silent protests” of 2011. However, most of the photos in the album cover national traditions, army, sport, art and other issues far from politics. In November 2012, Belarusian customs office confiscated 41 photo albums, which Belarusian journalists carried with them after a European tour. Ironically, the publishers printed the albums abroad and imported them to Belarus a year ago. They conducted all formal procedures, paid customs duties, and faced no problems at that time. This time the customs took a different view on the album and decided to destroy it. But, somewhat unexpectedly, they changed their mind and passed the case to the KGB. The KGB established an expert commission in order to evaluate the album. The commission included a representative of ideology department of the local executive authority, a criminology professor, a linguistics professor and an art lecturer, all from Hrodna university. The album Belarus Press Photo – 2011 contains deliberately distorted images of Belarusian politics, economy and social life, which humiliates national honour and dignity of citizens of the Republic of Belarus. It belittles the authority of Belarusian state and undermines the trust of foreign states and international organisations in Belarusian government. Hence, according to the Law on Counteraction against Extremism, humiliation of national honour and dignity forms an act of extremism. The court summoned to the trial the organisers of Belarus Press Photo contest Julija Daraškevič, Vadzim Zamiroŭski and Aliaksandar Vasiukovič. The court took the side of KGB and on 18 April declared the album to be extremist. It ordered to destroy 41 copies of the album. Over the last few years, the courts had a few opportunities to apply the Law on Counteraction against Extremism. Most of them had a similar plot: customs officers checked materials which people carried through the border, and then passed them to the KGB for evaluation. The KGB would then initiate court proceedings. Yet the outcomes of those trials break the myth of the total politicisation of Belarusian judiciary and its inferiority to security services. On several occasions, only one court ruled that the submitted materials were of extremist nature. The case involved compact discs with films “Lesson of Belarusian language”, the concert “Solidarity with Belarus” in Warsaw, and photos of 2010 protests in Minsk. In all other cases in the past, the courts dared to disappoint KGB. For instance, in 2008, the KGB did not like the article “War in Georgia” published in Svaboda newspaper. They argued that the article discredited domestic and foreign policies of Belarus and promoted extremism and genocide of Ossetian people. The court of Iŭje district recognised it as extremists and ordered to destroy 5,000 copies of the issue. However, on appeal the lower court decision was set aside. The trial of Arche journal, publication of Belarusian intellectuals, presents a more complicated case. Customs confiscated it in 2008 on Belarusian-Polish border and as usual, KGB filed an action. According to them, the journal contained a number of publications with extremist content. Three of them presented analysis of Belarusian politics, and the fourth, a review of ​Andrzej Wajda's Katyn film on the massacar of Polish officers by the Soviets in 1940. The KGB argued that “the analysis of the materials showed that the journal materials damage the image of government, increase social and political antagonism in society, encourage mass unrest and thus threaten national security of Belarus”. At first, the court of Brest recognised the journal as extremist and ordered to destroy it, but higher court subsequently returned the case for review. The KGB demanded another trial, but after expert evaluation of the materials the proceedings were terminated. These facts reveal interesting processes inside the Belarusian security and judiciary systems. KGB continues to hunt for witches occasionally, but it does not implement any comprehensive programs to combat dissent. The cases rather depend on initiative of particular department and district. Second, the courts do not always follow the political needs of the regime and may do their job fairly. Of course, this does not concern largest and most notorious trials, which Lukashenka controls personally. But local and minor issues can be resolved in favour of citizens, not the authorities. On 19 April Alexander Lukashenka delivered his annual address to the nation and parliament. For more than three hours he has been speaking about priorities on his current political and economic agenda and answered MPs’ questions. Economic modernization, privatisation and relations with the EU and Russia featured at the top of his agenda. All the topics went under an unusual headline – changes for modernisation. Like Lukashenka’s most public appearances, the address was full of self-promotion and contradictory remarks. On the one hand, he made several reform-oriented declarations. But at the same time he clearly reiterated the limits of what he intends to do. Like any charismatic political leader Alexander Lukashenka loves all sorts of occasions when he can talk directly to the whole nation. He regularly holds massive press-conferences for Belarusian and foreign media. He also meets journalists for short Q&A sessions during his visits to factories and collective farms in the country’s regions. All these media appearances are then extensively covered by state and oppositional TV channels and newspapers. During such events Lukashenka does his best to demonstrate that he stays in good physical shape and remains a master of public speaking. He laughs, jokes and holds friendly conversations with journalists. Sometimes he talks about his private affairs and sometimes sheds a bit of light on high-level negotiations with foreign leaders. In other words, he normally says what ordinary people like to hear. He also uses public speaking occasions to deal with the most sensitive current issues. He aims to make sure that Belarusians are aware of his own arguments and to beat the arguments of his opponents until they gain any ground in society. That is why, unlike the notorious public events of the Soviet times, Lukashenka’s speeches and press-conferences do not avoid contradictory issues. Annual addresses to the nation and parliament, that usually take place in April, also serve these PR purposes (like in any other country). But they additionally have a bit of special taste as their primary objective is to present Lukashenka's political and economic priorities. Lukashenka opened his address on 19 April with traditional words of praise towards the Belarusian socioeconomic model. He emphasised that the economy had overcome the financial crisis and now showed signs of healthy stability. Immediately after that he accepted that at the same time economic problems were growing. According to Lukashenka, those problems come from Russia and the EU, where markets for Belarusian goods are shrinking. “The key problem of our economy is competitiveness of Belarusian goods. To be winning in the highly competitive war on the world market we all the time need to update our knowledge, technologies, equipment and management systems. 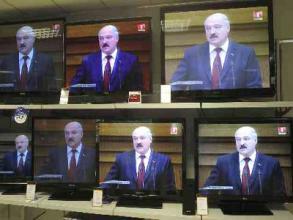 Therefore, today the fundamental idea for Belarus is the idea of a renewal”, said Lukashenka. At the same time the Belarusian strongman reiterated that the renewal does not imply abandoning the existing economic model and ideology. It should only be a new stage in the development of the generally successful development strategy. He suggested three big national projects that, in his opinion, would make an overall renewal possible. Firstly, economic modernization. Secondly, informatization of the society. Thirdly, support of young people in order to involve more of them in the process of state development. Lukashenka also underlined that Belarus can not isolate itself from global processes. Therefore, he concluded that the county's options look limited: "accept change or remain on the periphery of history". Numerous commentators keep asking the question of what stands behind the Belarusian government’s modernization rhetoric. Alexander Lukashenka gave them a sufficient answer last Friday. The reason is simple: Russia has already joined the World Trade Organisation and Kazakhstan, the other Customs Union partner, is on the way there. This means increasing competition for Belarusian producers. Therefore, there is no other option but quickly modernise the economy. By announcing that the modernization of the wood-processing industry has to be completed in early November Lukashenka again demonstrated what he means by the very term “modernization”. For him and his inner circle it appears like simply moving from point A to point B. As soon as they reach point B modernization will terminate. In other words, the authorities see economic modernization as changing equipment: let’s instal 100 new machines and build 50 new walls and we will be done with this modernization! The economic block of the address then transformed into foreign policy. Here Lukashenka managed to comment on virtually everything. He said that the relations with the European Union would now depend on the EU. If there is will on the part of the EU to improve the status quo Belarus then “will walk its walk very quickly”. It is difficult to guess what exactly he implied by this walk. Presumably, it reflects the unfolding behind-the-scenes negotiation process between Minsk and European capitals. And most probably it centres on the issue of the political prisoners. The Belarusian ruler also went back to his recent visits to South-East Asia (Indonesia and Singapore). He once again offered his rationale for travelling to such distant corners of the world stressing the potential for trade with the region. Then he proceeded to his usual rhetoric words about the significance of “third world” countries for Belarusian foreign economic relations. He even reiterated the governing rule of the Belarusian foreign policy: “we have to go there where we are welcome”. But the most exciting part of the whole address began when Alexandr Lukashenka tackled the Belarus-Russia relations. He began with banal compliments to the Customs Union and Single Economic Space and promised that the Eurasian integration would soon bear its tasty fruit for the Belarusians. But later he turned to the issue of privatisation in the bilateral relations that traditionally tears apart many agreements. After months of public and closed talks about the prospects of MAZ/KAMAZ unification Lukashenka boldly denounced the idea. He simply said that he did not see any value added in the prospective unification. And that according to his sources, the whole idea got inspiration from some Western competitors of MAZ, who only wish to destroy the Belarusian giant. Lukashenka then moved on to the issue of privatisation in general. At this point he asked the Russians “not to bind us a lot”. In the president’s opinion, the market “is in its lowest point”. And one can only privatise very cheap, which is not going to be the case in Belarus. Interestingly, the following Monday morning some Russian newspapers already published an unofficial response to Lukashenka’s address. They said that the Kremlin decided to suspend the signing of oil contracts Belarus was hoping to conclude.